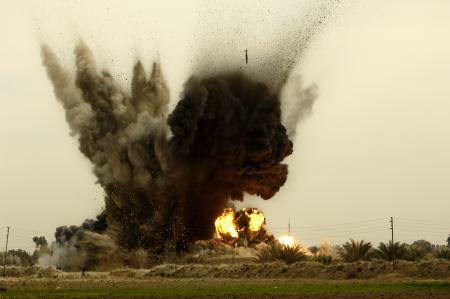 A B-1B Lancer drops six GBU-38 bombs on an al-Qaida torture house in Iraq in 2006. The Pentagon is pushing back on a media report that it is looking into its options for a military strike in Syria if called upon by the president. For months, Syria has been racked with violence as forces loyal to the government clash with anti-regime protesters. President Obama has called upon Syrian President Bashar al-Assad to step down, but he has also stressed the importance of resolving the issue through diplomacy instead of military intervention. But on Tuesday, CNN reported that the U.S. military has begun a review of what capabilities it could bring to bear on Syria should the president order military action. “One of the senior U.S. officials called the effort a ‘scoping exercise’ to see what capabilities are available given other U.S. military commitments in the region,” CNN reported. However, a Pentagon spokesman sent an email to reporters Wednesday making clear that no U.S. military intervention in Syria is imminent. No one wants to get into another muslim quagmire. The best thing to do with this one is help Turkey furnish supplies, medical care and whatever else humanitarian supplies they can. Stay away from this one. FIX AMERICA FIRST!